Live Person is another advice giving website that matches people who have questions to the people who are qualified to answer them. It is a situation where website wanted an right person which gives an correct answer to an specific question. Try to depict the life of a student. Another great website you help students who need help in variety of subjects and earn money. You can choose to teach your favorite subject . Choose amazing and different topic for your blog. You receive %80 commission which will be paid via PayPal. Now you can create tutorials, take photos, and provide services even when you’re not online and be paid for it. Plus you earn around 60% of what the person who you refer, spends in your Chat room. For every expert you refer you get $100. The pay is from $0.98 to $9.80 per minute. 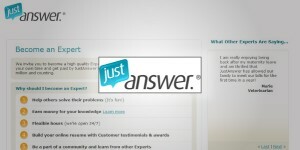 JustAnswer.com is an great place to get paid for what you know. Basically you answer questions that are priced from $5 to up to $25 or more. If the customer accepts your answer, then he/she will pay for it which will be deposited to your just answer account and once you have reached the $20 threshold, you can cash out via PayPal also. Our world having so many different languages. But English is the one language which is understood by everyone. It is admired in all over the world. Especially in my country India, it become an status language, and easily understood by everyone. Choosing a language of your own dilutes the market for your niche. Try switching to the language you think, it can bring you more money. With the help of your answer questions and if your answer is chosen to be the “awarded answers” by the people who are asking the question, your answer will be posted and you will get a percentage of the revenue generated by the Google AdSense, on the page that your answer is found. Like all websites, traffic is an primary condition and its very important for every sites. You can attract your potential followers by using many methodologies like creating hype, advertising the reliability of your Q&A websites. Post attractive articles by which every one getting excited and ask questions. You can charge money also, if you are good with giving advice to people then you can make money by giving advice to others over the phone on keen. In there you can set the price that you want to charge per minute. The easy and best way you can monetize your Q&A website is through AdSense, Infolinks and CPA. With Google AdSense you can place relevant Ads just below your questions. This will encourage people to click on the ads, bring lots of Money to your way. That’s it.